In discovering National Novel Writing Month (see NaNoWriMo: Write a novel in 1 month? ), I found out about many people who have given themselves an amazing goal and successfully carried through with what seems to be a daunting challenge. Yes, there are many like myself who write a few hundred words, possibly a thousand, for the occasional blog posting however this is an endeavour of a limited scale in comparison with the task of fashioning an entire book. Imagine the greats who are on the bestseller lists, who seem to be constantly churning out not just books, but publicly acclaimed books. Where could any one of us who has never undertaken such a project possibly start? I think of that classical scenario of somebody or another who is known in the context of a job or a career but has this unfinished novel sitting in a bureau drawer that they have just never gotten around to finishing. 25 years later, I’ve written 33 novels (plus one I did anonymously as work for hire), am working on a couple more, and intend to keep writing novels as long as I live. Wow. That's pretty impressive. Before I turn 25. Heck, I don't remember ever saying such a thing to myself. Are there other people who make such declarations but then actually follow through on them? I always joke at New Year's by saying my resolution is to quit smoking. The joke is that I don't smoke but add that I like to start with something simple and work my way up. Holly Lisle (born 1960) is an American writer of fantasy, science fiction, paranormal romance and romantic suspense novels. She is also known for her work in educating writers, including her e-book Mugging the Muse: Writing Fiction for Love And Money, the Forward Motion Writers' Community web site, and her novel writing course How to Think Sideways. 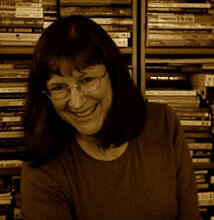 Her web site is not just about advertising her work that is selling her books, but offers help to other writers. As she says, "I make a full-time living from writing. I know a lot of writers who would like to do the same. So I've written over 100,000 words -- all of it available for free in the linked articles to your left-- on how I do what I do." I glance down a column called FAQ and see topics on publishing, literary agents, How To Write, editors, money and more. She has put together courses on topics related to writing a novel like character creation, plots, language, culture and "page-turning scenes". A list of "How To's" shows Quit your day job, format a manuscript, start a novel, create a character, finish a novel and steal ideas. Hmmm, steal ideas; now, that needs a little perusing. I thought to take a look at this article since it seemed both humorous and nefarious. However there is nothing really underhanded about this at all. Painters, musicians and yes, even writers look at what others do. It can be a source of inspiration and a source of ideas but Holly points out quite rightly the difference, the big difference between borrowing an idea and plagiarizing. As she puts it, "Only steal the gem -- don't steal the whole crown." In mulling this over, this advice seems to be reminiscent of Stephen King. In his book On Writing (see my review), Mr. King advises very strongly that a writer needs to read and read a lot. Obviously the development of the craft of writing requires study as well as practice. And what better way (heck, what other way?) to study the craft than by reading? Pick up your gems from here and there and put together your own crown. Not original? As the old saying goes, "There is nothing new under the sun." But there is always a new twist to an old tale. If having written 33 novels isn't impressive enough, you can find a ton and a half of various blog postings, articles and diary entries about all sorts of things relating to Holly's craft of writing. She does state that she's put down a hundred thousand words on the site about writing with the idea of passing along to the rest of us her knowledge and experience in successfully producing 33 novels over the past 25 years. Gee, that works out to be on average a book every nine months. I think back on NaNoWriMo and the task of putting down fifty thousand words in one month. However that is only the start. One does have to revise one's work and probably more than once. Mr. King points out that he completes a work then sets it aside for a month or two. He explains that you need to distance yourself from your own work so when you do revise it, you are doing so in a more objectively. Holly, giving similar advice, talks in "Your Book Is Not Your Baby" about having to work hard to create what you want. You don't just "give birth to a baby"; you actually have to put in the effort to write your book. This article I found to provide some interesting insights into how one goes about the odd task of writing for a living and dealing with others who may not see this as a legitimate job. * Do not expect them to understand. They won't. They will not get what you are doing until and unless you are as successful as Stephen King or John Grisham, and I'll bet even those two writers occasionally get calls from their mothers asking when they're going to get real jobs. * Do not expect emotional support. When things get rough, the response you can count on getting is not 'hang in, you'll make it, I believe in you,' but 'I told you so before you quit your job. Maybe if you're lucky they'll take you back.' Hang in anyway. You believe in you. You cannot expect everyone else to see your dream. * Do not expect consideration. You have a job, right? You're going to be sitting at a keyboard stretching your brain for God knows how many hours. Your family (and friends) will keep this in mind, right? Wrong. Your family and friends will figure as long as you're home all day, you might as well be doing something useful, like laundry, or running the kids everywhere, or going out to breakfast or lunch or shopping or .... The list of things other people will find for you to do is endless and destructive beyond belief. Given the opportunity, they will kill your writing, then shake their heads when you fail and say they always knew it wouldn't work. Guard your time fanatically. [chuckles] I come back to the scenario of the person who has the pipe dream of being a writer but never gets around to the unfinished opus in the bureau drawer. It does seem a little fantastic to think of writing for a living. While it sounds interesting, even romantic, I'm sure that like any job a lot of hard work is involved. Yes, we may dream of the glitz and glamour of having our name on the New York Times bestseller list or being interviewed on TV but a lot of hard work went into getting there. Plus a little talent, eh? Ha! Put all that together and I would say that it's no wonder many would look with a bit of scepticism upon any of us declaring our intention to write. I've never written a book. I've never done NaNoWriMo. I started this blog on June 1, 2010 and one month later, a small online newspaper found my blog and asked me to contribute some articles. Now 8 months later, I've managed to pump out almost a half a million words. Well, I guess I can shoot my mouth off; at least in chunks of a thousand words or so. I don't know about a book. I feel certain Ms. Lisle would concur. But like anything, if you enjoy what you're doing, it's not so much work as having fun. In my blog Passion: Can you live without it? I talk about the idea of being "passionately" interested in what you do and how I have at times amusingly said, "What? I have the privilege slash fun of doing this and get paid for it? Heaven!" It may sound funny but believe me, it's true. Some poor Joe has to slog it out doing some horrible job where he spends his shift looking at the clock for when he can go home. In contrast, to have something so interesting, so rewarding, you find yourself doing the work on your own time out of the pure, unadulterated thrill of successfully solving the puzzle is passion! Holly Lisle is a full-time novelist who also teachs writing. She has 32 novels in print—written over the past 17 years—and is working on her 33rd novel now. Her offbeat perspective drawn from a decidedly eventful life, and her tendency to analyze everything, have given her a unique—and remarkably successful—approach to writing fiction. And after thousands of requests for her to show writers exactly how she does what she does, from coming up with ideas through developing them to writing, editing, and selling both partials on contract and finished novels on spec, she spent eight months working 70-hour weeks to create the How To Think Sideways fiction-writing course. Her approach has proven successful for her students, too. This is a site filled with people who are following the treacherous path toward traditional publication. It isn't an easy hike, but there are many members willing to help. This is also a place where you can share both the joys and the insanity of writing with those who understand what you are talking about. Forward Motion's core purpose is to help writers become professionally published, which includes big publishers, small press and electronic publications with a traditional set up (submissions, chance of rejection, and editing as part of the regular makeup of the company). We welcome serious writing hobbyists as well, but our purpose and goals are geared toward professional careers.